Lately my game has been pretty good, well at least I am consistently shooting my handicap. Then one day three weeks ago while playing the Faldo designed Summit Windmill golf course in Bangkok our golf professional advised me to analyze my shot statistics to find out what was going “right” with my game. Two rounds later, (1) at Amata Spring Country Club in Bangkok and (2) Siam Country Club in Pattaya, I found out what was the key to getting my Thailand golf scores down. You see I was getting to within 10-20 yards of 12-14 greens in regulation, which told me my long game was pretty good. Then I realized that getting up and down was the key to scoring well. Since my putting from within 5 feet or so was fine, it was those dreaded long ones that were limiting my score, and probably yours too. Rather than work on sinking more 20 or 30 foot putts, a highly unlikely feat even for the golf pros, I decided to work on eliminating the long putts by mastering two shots around the greens: a low runner and a mid-to high flyer. Knowing how to hit these two approach shots got me to within 5 feet of the pin and saved me strokes. When putting, I find it’s always nice to have 3-4 foot ones instead of 10 plus footers needed to save par. Let me tell you what I found out. First I devised 2 separate chip shots for my short game arsenal. Shaft and spine lean at address and wrist control in the follow through are the keys to mastering these 2 close-in shots. Both versions require a different technique to execute successfully. Shaft and spine lean control the height of each shot. Wrist control in the follow through controls how much back spin the ball has, and hence how far it rolls after hitting the green. To help, I have named and summed up each shot. The low runner is a low risk shot. With slow greens (like at the Phuket and Chiang Mai golf courses during the rainy season) or with plenty of green in front of you, use an 8 or 9 iron and think of the stoke as a putt. 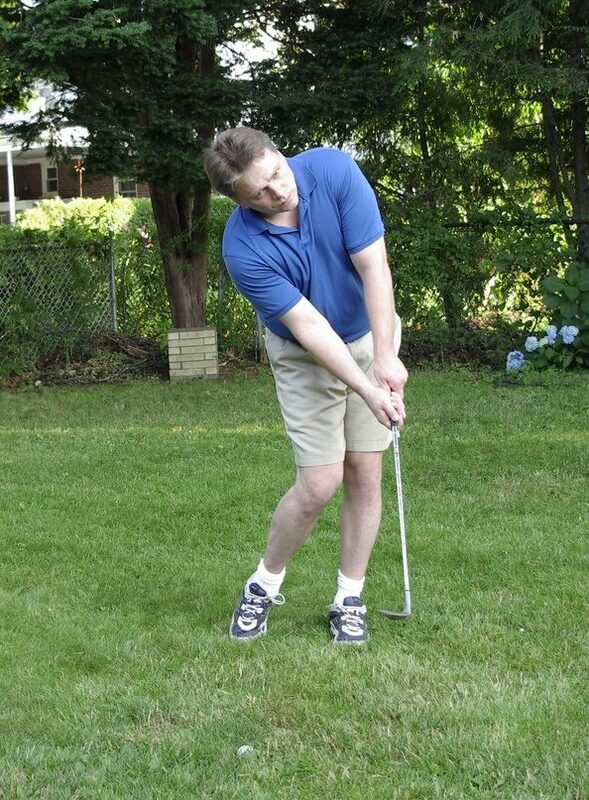 Play the ball back in your stance, keep your front shoulder lower than the back shoulder, and lean the shaft forward. Then hit the ball with a descending blow being sure to keep your wrists stiff (think putt). The ball will fly low, straight, and run out for quite a bit after hitting the green. In most cases I aim for the point on the green just over the fringe. The mid-high flyer is a moderate risk shot. It is good for close cut pins and when there is only a small amount of green to work with. For this shot a rather grassy lie is preferable than a close cut fringe as you need to get the club under the ball. Use your most lofted club, either a lob wedge or low bounce sand wedge will do. Play the ball in the middle of your stance, keep your shoulders level, and lean the shaft forward just slightly. You want to take advantage of the true loft of the club. Keep your wrists as flexible as possible (think rubber wrists) and use a wrist motion akin to what a painter uses when painting a building. When you hit the ball it will go up in the air and land softly on the green with minimum roll. I practice these three shots whenever I can. And definitely you can use on the Thailand golf courses. Mastering them will turn you into a tuned scoring machine, and that will drive down both your Thailand golf scores and your golf handicap.